Do you want to use more video in your Twitter marketing? Wondering how each type of Twitter video works? With the launch of its native live video service, Twitter is prioritizing video higher in the news feed, making it the perfect way to reach your audience more often. In this article, you’ll discover how to use video on Twitter to better engage your audience. Twitter Video: How to Create Engaging Video Content by Beth Gladstone on Social Media Examiner. Twitter now lets you broadcast live video from within the Twitter app on iOS and Android. The live video feature on Twitter is “powered by” Periscope, but it’s not necessary to install Periscope or create a Periscope account. Using live video lets you capture moments on the go and take advantage of Twitter’s real-time nature. To start a live broadcast, compose a new tweet and tap Live. Note that only public accounts can use the live video feature. Start live video from within the Twitter app. The camera then opens and allows you to record facing front or rear. Add a caption in the “What’s happening?” field to tell users what your video stream is about and entice them to tune in. Finally, tap Go Live to start your live stream. Add a caption and begin your Twitter live video stream. While you’re streaming, viewers can join the live video and tap the screen to send comments or hearts. Some broadcasters interact with comments during the live broadcast, allowing viewers to ask questions and add their thoughts to the conversation. To end the live video, swipe down and tap the End Video button. After your live video ends, it appears as a tweet and will remain in your timeline, providing additional exposure and views from your audience. Your broadcast will also be available on Periscope, even if you haven’t registered for an account. A live video and an uploaded video look different in the Twitter timeline. A pre-recorded video shows the video length in the bottom-left corner. A pre-recorded Twitter video shows the video length in the lower-left corner. A live video that’s been recorded shows the word ENDED and the number of views from the original live stream. Also, a small Periscope icon appears in the top-right corner. Your Twitter live video will be saved as a tweet so viewers can watch it after the broadcast has ended. Uploading pre-recorded video on Twitter has a few key benefits. You can plan and schedule your social media content in advance and create the perfect video clip, rewriting and editing it until you’re happy. For businesses, it allows employees to create spontaneous video content and then seek approval before posting it. To upload a video to Twitter on desktop or mobile, compose a tweet and click the camera icon. Then choose a video file stored on your computer or mobile device. Upload saved video content directly to Twitter. Twitter supports MP4 and MOV video formats. On desktop, the file size must be under 512MB, and all uploaded videos can’t exceed 2 minutes and 20 seconds. If your video is longer, Twitter will prompt you to edit your video length using the trim tool provided. Trim your video length to upload it to Twitter on desktop. To record a video, open the Twitter app on mobile. Hold down the video icon to capture what’s happening around you. If you want to add more to the video, simply hold down the video button again. The new clip will be added to the video automatically. You can record up to 2 minutes and 20 seconds of video. If you’ve recorded multiple clips, you can drag a particular clip to delete it and even change the order of your clips. You can add, move, and delete multiple video clips in the Twitter mobile app. Before posting, press Play to preview your video. When you’re happy with it, click Done and write a tweet to accompany it. Twitter recently removed the Vine app and replaced it with the Vine Camera app (iOS and Android). The app lets you create the same short looping video, just without the specialized community for sharing it. You can create 6.5-second video loops with the app. Just hold your finger on the screen to record. When you’re finished, you can share your video to Twitter using the upload video function. Share your finished video from Vine Camera. Any videos posted to Twitter that are 6.5 seconds or shorter will automatically loop, just like a Vine. So you can cross-promote content, taking short clips from Instagram or Snapchat and sharing them to Twitter. Studies show the best-performing videos on social media appear in the user’s feed, play in silent mode, and are shorter than 15 seconds. Posting short video loops on Twitter lets you capitalize on this. Now that you know the three types of video you can share on Twitter, let’s look at some tips for making the most of your video content. Mobile video viewing has nearly doubled each year and users spend more time watching videos on mobile than they do on desktop. That’s why you need to optimize your videos for a mobile audience. Keep your videos short and ensure they can be understood when viewed in silent mode (most viewers watch without sound on mobile). So happy with the victory tonight and to have reached in European competitions. You can also use the accompanying tweet to provide more context to the video. Rather than guess what your followers want to see, ask them! The results may surprise you and can inspire engaging behind-the-scenes content campaigns. When the UFC social media team asked fans what they wanted to see, they were surprised by the responses. Rather than ask for more content inside the octagon, viewers wanted to find out more about the fighters’ daily lives, including their training regimens. 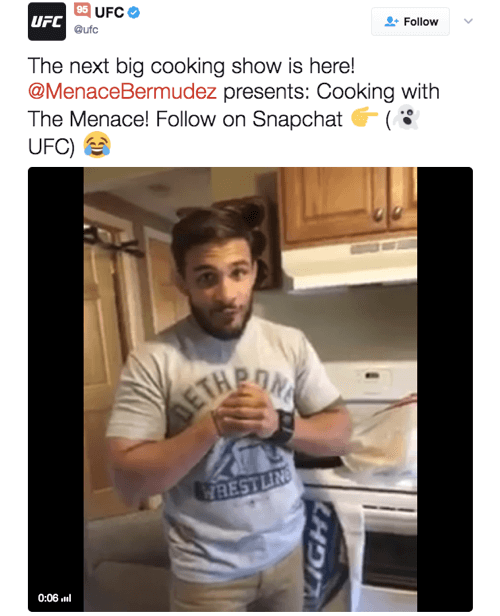 As a result, UFC created a “cooking with” video series that gave fans an inside glimpse of what the fighters cooked and ate in the run-up to a fight. UFC’s video-led cooking series is popular with viewers. Use live video, a Twitter poll, or just a tweet to find out what videos your fans want to see. This is a surefire way to grow your audience and encourage people to return to your account regularly. With Twitter’s real-time nature, many accounts schedule tweets in response to events or timely campaigns. The same principle applies to video. Use the Events tab in Twitter Analytics to create video campaigns that resonate with your target audience at a specific time and date. Twitter’s Events tab tells you about upcoming events and lets you create video campaigns. Tap into live events where people are already engaged in conversation and add your voice with Twitter video. Provide your own commentary with a live video related to a topic or event. Alternatively, you could pre-record content and schedule it in advance, allowing you to tap into opportunities and provide top-quality content. Just like a TV show, use episodic video content to connect with your audience. It’s shareable and makes viewers come back for more. This content could be in the form of weekly recipes, specific tips (e.g., “Monday Motivation”), or a live video at the same time each day or week. Another option is to create teaser videos for a product or service launch, or a new initiative that goes live in a series of parts. Sharing daily or weekly video content on Twitter helps build consistency. Use templates and formats to help make this process easier, particularly for pre-recorded content. Producing video content on a consistent basis builds anticipation and gives users a reason to view your profile, instead of waiting for them to stumble across your content in the feed. The most effective content is often the type that connects with a single user or niche audience. With Twitter Advanced Search, do simple search queries to identify topics your audience is seeking help with. For example, if your expertise is content marketing, type in the search phrase, “content marketing can anyone help?” In the search results, you’ll see a rich list of video topics you could create as short-form content to educate your audience. To take this a step further, create video content that responds to a specific user problem or question. Just include the search operator “?” in your search and test different combinations of keywords until you find your target audience. Use Twitter Search to find topic ideas for your videos. To reply to a user with a direct video on mobile, click Reply and then click the video icon. Record your video and add to or edit it as needed. When you’re happy with the result, click Done. You’ll have the chance to write a message to accompany the video before it’s delivered as a direct reply to the user. Again, because videos don’t count toward the character limit, this is a great way to provide more in-depth customer support or outreach within Twitter’s condensed format. When you get new followers, rather than use the standard auto-tweet reply or worse, why not send new followers a 5- to 10-second video clip? You can record it from anywhere and give new followers a personalized welcome to your network. You could also use templates, as shown below, which are more engaging and interactive than an auto-tweet alone. Sending a personalized video thank-you is much more engaging than a static tweet. To take this a step further, create a personalized onboarding process for your followers. You could send an initial hello and then two weeks later, send a personalized video asking for their thoughts on a specific topic or trend. This mirrors the type of engagement often seen on channels like Snapchat, which promotes higher one-to-one interaction between users. Changes to Twitter’s platform, including a focus on live news and video, have changed the way users want to connect with businesses and individuals on the platform. Now is the perfect time to start using Twitter video, which is an underutilized marketing method. What do you think? How have you used Twitter video to connect with your audience? Which type has worked best for you? I’d love to hear your thoughts in the comments below.